Published Friday, April 27, 2012, OK personal/derivative use; link www.lovethatimage.com. I’m very excited that this week Sara’s Fave Photos Blog is the featured blog at Beverly’s delightful party of pink, Pink Saturday. Thank you, Beverly! 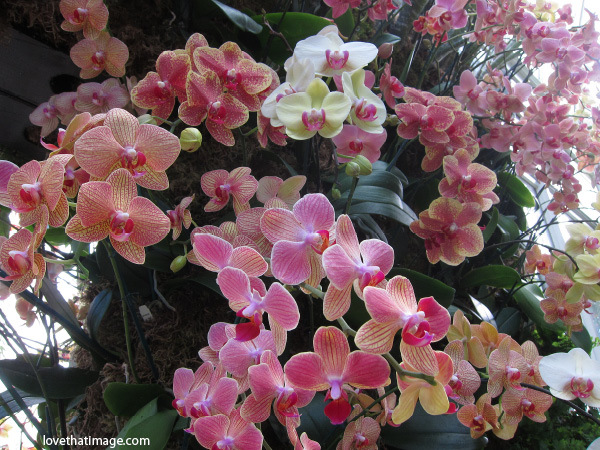 I thought I’d have some special orchids from my recent visit to the New York Botanical Garden Orchid Show. It was amazing and inspirational. 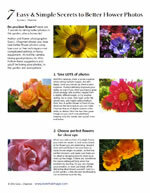 Here are three photos showcasing their remarkable display, in pink, of course. Also, please visit Weekend Flowers, Floral Friday, Ruby Tuesday 2, Today’s Flowers, SOOC Sunday (straight out of the camera), Shadow Shot Sunday 2, and Mellow Yellow Monday, if you have a moment or two. Great memes! 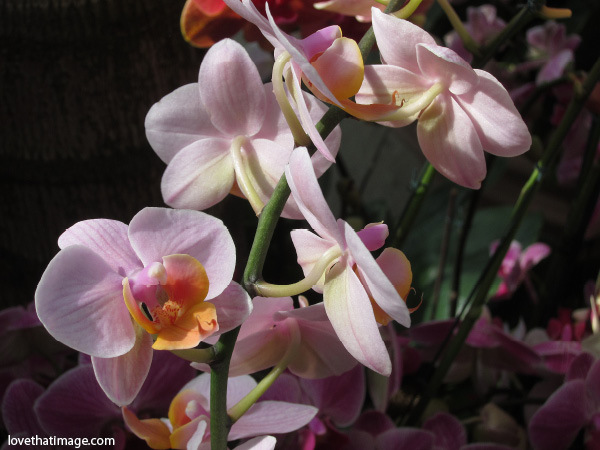 Gorgeous orchids, Sara! I am stopping by from Pink Saturday. Sara, your pictures are just lovely! I wish I could grow orchids!! I have one small one that my husband got me for Mothers Day last year, but once the blooms were gone, they stayed gone. I did get a new leaf that I got all excited about. lol! Happy Pink Saturday and have a great weekend! Your orchid photos are just beautiful. Thank you for sharing. Happy Pink Saturday. Absolutely beautiful! 1st time here and at Pink Saturday! Thank you! Beautiful photos..and glad to meet you! These are beautiful! Happy Pink Saturday to you! Just dropping by from Pink Saturday. Your orchids are beautiful, Sara, and so is your photography. What a lovely place to visit. I dearly love strolling through gardens like this. The orchids are dazzling, the shadows seductive! Congratulations on being featured at Beverley’s! 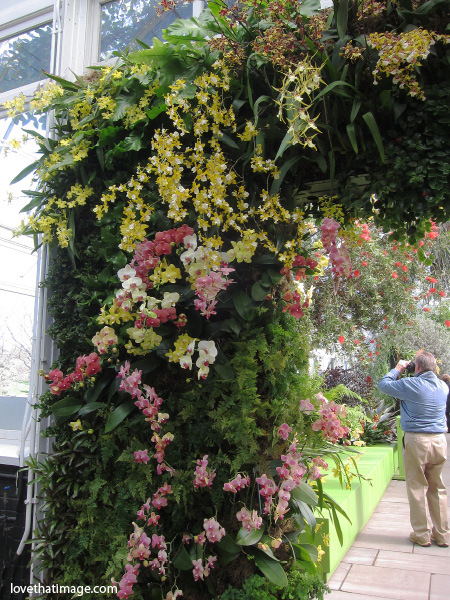 Your orchid photos are just delightful and that orchid arch is magnificent (wouldn’t mind that in my garden instead of my ivy arch). Ditto, I think that arbor is gorgeous too! Have a great week-end. Thank you for your contribution to Shadow Shot Sunday 2! Luscious shadows. Have a safe and happy weekend! Hi Sara..your photos are fabulous! Happy Pink Saturday, Sara. I hope you enjoy being the featured blog. I know it was wonderful for all of us. I appreciate all you do to make Pink Saturday special. Oh my! What an incredible display of such magnificence. I know it must have been breathtaking to see. I adore orchids. Have you ever been to Fairchild Gardens in Miami? It is off of Old Cutler Road, and prior to Hurricane Andrew, Old Cutler Road was canopied by orchid trees. It was a lifelong memorable drive when the trees were in bloom. Thank you for sharing your beautiful photos. I hope the sun is out for you again today.